I’m Miriam Sagan, poet and writer. I founded and now run the creative writing program at Santa Fe Community College. Most recent books are MAP OF THE LOST (UNM Press) and SEVEN PLACES IN AMERICA (Sherman Asher). I’m working on site specific poetry installations. You can reach me at msagan1035 at aol.com. On Miriam’s Well I’m looking for guest bloggers, published poets to interview, and projects to cover. The blog focuses on poetry–particularly of Santa Fe and of the Southwest–but I’m also covering land art, painting, travel, and serendipitous ideas. I welcome your comments and suggestions! Look at the categories list and send me something that fits. I really look forward to your work. Miriam’s Well publishes previously published work as well as unpublished, and does not consider that it has acquired any rights to your work that is posted. I’ve now been blogging for a year, and I’ve certainly been enjoying it. It has allowed me to follow out many creative threads–and within a community. When I started I originally if privately defined the blog as a place for my own work and that of my community. I thought of community loosely–including people I saw frequently, students, old friends, family, and lines of connections that would include people like my step cousin’s friends. Of course the internet extended this even further, but it is a definition that works for me. I like all the usual things–audience, comments, connections, serendipity. I’ve particularly liked interviewing poets and now artists and having a forum for book reviews that less formal than the columns I produced for so many years in newspapers and magazines. Blogging my trips and retreats has been very rewarding–I so want you to see what I saw, taste what I tasted. Secretly, I think I started the blog “in case something happened.” But what? A brilliant poetic idea, a personal disaster, the collapse of civilization, or access to some great recipes? The blog is a kind of holding tank, although I don’t yet know everything it is holding. My only frustration, if it can even be called that, is that I feel I’m missing some use of the blog. And what else is out there? Are there couples or households blogging together? I don’t mean a team of three editors–I mean something like three people running an organic farm who don’t necessarily get along all the time. I’m still looking for the intimate, the funky, the bywater…and the collaborative. What is a secret made public? Or even just the private exposed? Gossip? Wisdom? 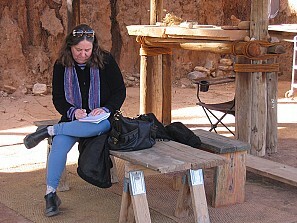 Miriam Sagan working at The Land/An Art Site. Photograph by Hope Atterbury. A recent interview with UNPRECEDENTED REVIEW describes my working process. 1. What is your writing process like? Do you write early in the morning or late at night? Do you write every single day or occasionally? When I started off writing seriously—I was about 16—I wrote a poem a day. Bad poems, no doubt, but I was hard at work. Now I’m 62 years old, and I’m still production oriented. But my process has gotten more relaxed over the years. It used to be first thing in the morning. Now it is just when inspiration strikes. I have an office at home, a writing studio in my yard, an office at work, a notebook in my purse…and yet I’m happiest writing in bed, preferably in a motel somewhere remote and beautiful or funky. I write most days, but if I can’t write for some reason I no longer freak out—I trust the process more. 2. What inspires your poetry? Intensity. A sense of connection, Falling in love. Having my heart broken. The birth of my daughter. Being widowed. Falling in love again. Travel. The Southwest. National Parks, diners, roadside attractions. Iceland. Solitude. Death. Buddhism. Judaism. Beauty. Destruction. And also—very importantly—reading poetry, other poets, great masters or my inspiring friends. I feel each poem comes out of a very particular if fleeting state of consciousness—the passing moment. I want to share that. 3. What was the biggest challenge for you when you began publishing? Insecurity, I guess. I was published young and frequently by the small press world, which has remained my home. But then I’d hate what I wrote, and would suddenly see its flaws once it was in print. And then I’d get an attack of shame and fear over how exposed I was. I once told my father he couldn’t read a book I’d written—I think it was DIRTY LAUNDRY: 100 Days in a Zen Monastery (La Alameda Press, re-issue New World Library) which was a joint diary kept by me and my first husband Robert Winson. It was pretty raw stuff. I told my dad—“I need privacy” and he retorted “You have a kind of odd way of showing that!” which was funny and true. It remains a problem to this day. Rejection is an obvious challenge. I didn’t like it when I was starting out—I still don’t. But I got used to it. The self-loathing is harder—it still remains. I’ve learned to sit with a book when it comes out and have some emotional space before it goes public and the promotion begins. 4. What advice would you give other poets trying to break into publishing? You just have to persevere. Send out, send out, send out. Don’t get sidetracked by rejection—it doesn’t have much meaning. There are so many great magazines out there—and very lively e-zines. Try new magazines, but do read so you get a sense of the editors’ taste. Also, build your community. Create it if you have to—start an open mic, a magazine, a writing group, a reading series, a blog. Promote yourself but with your fiends and fellows—it is much easier and more fun. And write a better poem. I recently was serving as interim Poetry Editor for The Santa Fe Poetry Review. I read 3000 poems. The majority were generic. Poetry is not a neat tidy art. Aim high, fail beautifully. A fine poem will always get published if you send it out enough. 5. If you could only write one more poem in your life, what would you write it about? A perfect haiku that awakens the reader to the nature of the world and the nature of the self. It’s a great question, but I have to tell myself—dream on! It may not be possible. 6. How do you want to be remembered in the world of poetry? Or in other words, if you could write your own obituary for your poetic legacy, what would you want it to say about your work and yourself? Actually, twice in my life other people have said things that remain my sweet spot. Jim Sagel, a northern New Mexico writer who died too young, once introduced me as “an activist for poetry.” He was too—and that impetus to bring poetry into my communities has been a powerful force in my life. Recently Julia Goldberg, a DJ on Hutton radio who has been a friend for many decades called me “Indie before there was Indie” which made me happy. It made me feel cool, which I’m still susceptible to enjoying, but it kind of packaged a lot of what I’ve done, including secret give aways of poetry books for years at various locations around town. (I’m currently stocking a half dozen Little Free Libraries in Santa Fe with poets). I’ve put poems on earrings, metal street signs, windows, porcelain birds, glass sculpture, Miami’s South Beach, poetry posts, trees, and more…right now I’m designing a public art haiku garden with poems on stoneware pebbles So maybe I don’t exactly want to be remembered as myself—I’d be happy if people stumbled across a poetry installation and were touched by the words..
Miriam, I enjoyed perusing your blog. Reading the comments by a former colleague of mine at the University of Delaware was particularly interesting. I read about your blog at Issa’s Untidy Hut. I may have several questions later, but for now I was wondering if you publish haibun. Certainly–but probably best if it ties in with some of the blog’s usual themes. Thank you for sharing your well fresh poetry for folks like me to enjoy. Hi, It’s so nice to hear from you after a long time! I’m glad to know about your blog; I’ve put it on my RSS reader. Miriam, I found your site via your P&W ad. So glad I did! I’d recommend Denver poet Chris Ransick for a profile. Cheers from the Mile-Hi City! K.
Thinking of sending some poems and recipes. I have the Poor Poet’s cookbook too! Met you long ago at the IWWG conference in New Mexico. How do I send a recipe? Should I send to you or post it to recipes on your blog? If it is right for the blog I’ll post it and notify you. Basically I’m functioning as an editor–and you can’t post from outside. Thanks! Miriam- I hopped on over after your comment on “The Road Less Taken”. I had to subscribe! Thank you so much for your work!! Thank you! Don’t forget–I’m always looking for contributors. Dear Miriam, I just read your book and want to thank you for sharing your story. I came to US 5 years ago from china just to marry my dying husband, after being a full-time caregiver for 5 year and now I’m a 5-month widow. The Chinese name I gave to my husband is: as small as a mustard seed, I feel I had been searching for something alone in the darkness, now, I do know, it’s not all darkness and I’m definitely not alone. I started blogging after Gil passed away, which is helpful. Take care! Thank you! As you know from the book–I found a grief group very helpful–and there are now some good resources on the web. Take care of yourself. We have just put out Haiku Pix Review #1, Winter 2011,,, a paper litmag including some renowned haijin internationally ,,, Would you like to see it? And maybe take your blog readers about it? I was a grad stud at UTEP creative writing dept at one time and I’m hot for South West ever since! I am back on your website! You kindly left a message on my blog newly renamed ‘Wild Writing’. Yesterday, I was reading again Natalie Goldberg’s ‘Wild Mind’ when I read a text you wrote in it. I will definitely be back and will try to send you a couple of texts soon. I will try to find cool spots in France where aspiring writers can find inspiration. Thanks again. Broadside created especially for this event available for $2-$5 donation to Teatro. Refreshments and book signing to follw reading. You are very welcome! Thanks for reading. Glad I found the blog. Look forward to reading it more. Re: Baba Yaga — have you read Cat Valente’s gorgeous novel “Deathless”? I’m planning to! My daughter said she’d get a copy and lend it to me–have to remind her. By the way I like the writing on your blog a lot. Send me something you think might be good for my Well? Thanks very much yet again, Miriam, for including submission details about the Atlas Poetica Special Feature that I am editing, called “Snipe Rising From A Marsh – Birds in Tanka”. Comprised by 3 – 5 tanka per poet, contributions should be emailed to editor Rodney Williams at williams.rodney.a@edumail.vic.gov.au, using a title line that begins with “ATPO submission_Birds in Tanka”. It is a very interesting blog. Plenty of good reads. Thank you for dropping by my blog and making time to read it. It’s a pleasure to find your blog, and am sure to enjoy it. Hi there, you have a really fabulous blog, I could browse it for hours. I hope you are having a good sunday! Miriam, thanks for stopping by my site and liking one of my poems. This is turn has led me to your site which has peaked my interest which I will be checking into more thoroughly. Thank you. Thanks for liking one of my poems. I’m loving the challenge of NaPoWriMo – I usually spend a long time polishing before publishing! Really excited to find your blog, and to read that ‘the process of poetry for Miriam is metaphor’. So true. AMAZING…I have read several of your pages…and I loved the poem that you inserted that your Mother wrote….YOU are so strong and energetic to do all that you create and help others to be proud of their writing—you are great! Some day, I will send you something…or, if you see anything on my blog,,,that you think would be appropriate…I am totally for you sharing it! Thank you! I am honored you read my humble blog. I do some poetry, I call it near poetry because I have not been trained to do poetry, but I think poetry comes from within and that is the crux of a poet. You have my permission to use any of my work as I have been blogging for ten months and have a lot of stuff on my blog. Some of it is good and some not so good. Just let me know what you find interesting. Thanks, Barry PS I have been to Santa Fe, great place. Your blog is always interesting, always moving in new directions. I’m glad I rediscovered it and have time now to explore more. Just bought your ‘Maps’. (I like maps).